I was a kid who had trouble learning to read. I had a speech impediment. I had a lisp and trouble with my “S’s, my L’s, my R’s and my W’s”. I think I must have sounded like a little girl version of Elmer Fudd… just add a little Sylvester to that. When the kids laughed, I shut up, locked the mouth and threw away the key. In class, of course, we had to read aloud, but I would not let those letters get me. I refused to read. After a few weeks of this, my parents were called in. We were alone in the classroom after school. I had that queasy “I’m in twouble” feeling as Ms. Bianci told them that when she called on me to read aloud, I would shake my head NO. My mom and dad told my teacher that I read all of the time at home. I had stacks of Archie and Harvey comics everywhere and my favorite BIG book of “What do People Do All Day” by Richard Scarry. They told Ms. Bianci I would sit and draw and read and draw and…. “I read the picthurz” – I said. There. It was out. I couldn’t really read. My father took it on as his personal mission to have me up to first grade reading level before the end of the school year. Every night we would sit for an hour and I would read with him, out loud. We started off with all of his old, Catholic school readers. Then, he began to come home after work with little books from the store. 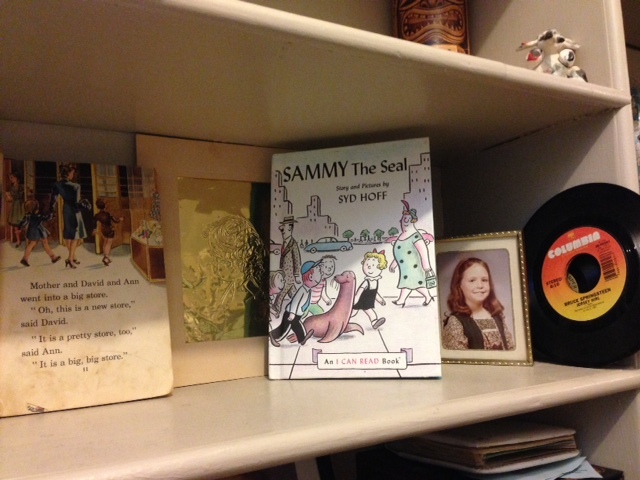 Golden Books, Wonder Books, I can Read books with Saggy Baggy Elephant, the Color Kittens, Sammy the Seal, the Cat in the Hat and Sam I Am. Every time I proved I could read one of these all by myself, out loud, I could get the next book. Each book became a coveted prize won by my own hard work and achievement. Poky Little Puppy lead to Go Dog Go!, The Best Word Book Ever lead to Mr. Pine’s Purple House then lead on to To Think That It Happened on Mulberry Street!. As I got better at reading and pronouncing things correctly, I was building my own library, meeting new characters, inspired to draw by the illustrations and falling in love with reading. 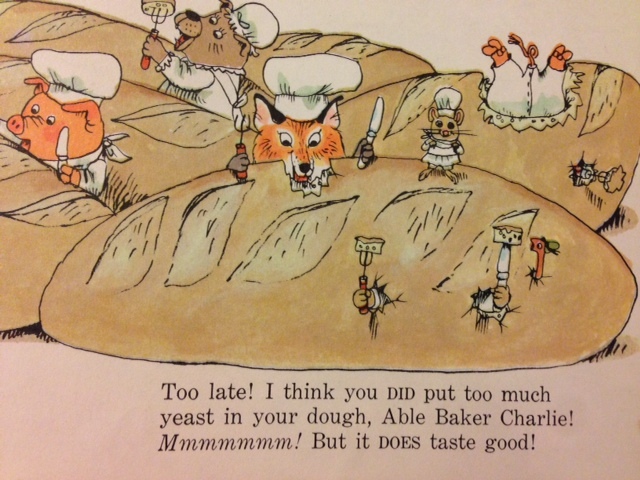 At the end of the school year, I brought in my favorite “What do People Do All Day” book to class and Ms. Bianci had me stand in front of the class and read my favorite page about Able Baker Charlie, out loud. They bake a loaf of bread so big, the whole Busy Town can eat it and Lowly Worm pokes right out of the loaf! I know, for certain, the importance of a parent reading with a child. My dad had no idea then, that I would go on to make books for children some day. He was being a good dad trying to make sure that his child would do well at school. My mother was the book lover who handed me some of her own favorite books as I got older: Little Women, A Tree Grows in Brooklyn and Jane Eyre. By that time, I was an avid reader with my own favorites, From the Mixed–Up Files of Mrs. Basil E. Frankweiler and A Wrinkle in Time. 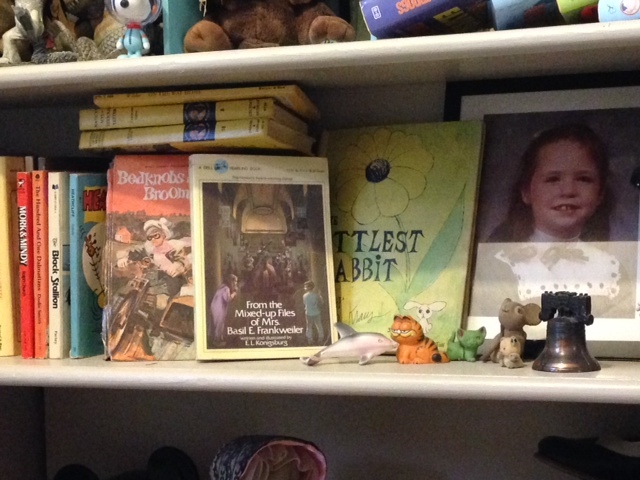 On the shelves in my studio sit many of my original books from when my dad would sit and read with me. The books that I lost through the years, I have scoured the internet for. When they come in the mail, I rip open the package and it is like seeing an old friend again. So much more came out of my struggle with learning to read than my ability to read aloud and pronounce my letter sounds. I developed a closer relationship with my dad and with books. I now have a fourteen-year-old daughter who I call “The wood chipper” because she reads THAT many books. I could not wait to buy my own baby books! I started the day I found out I was pregnant! I bought one Dr. Seuss and One Richard Scarry. She has grown up having book discussions and she is my go-to critic and book reviewer. Her love of reading gives me a feeling of security about her that she will always have books to keep her company and inspire her imagination. I think I’ll go up to my studio and visit my old friend, Lowly Worm. Thanks Nerdy Book Club for having me and for all that you do for readers. Kelly Light lives in New York but grew up down the shore in New Jersey surrounded by giant roadside dinosaurs, cotton candy colors, and Skee-Ball sounds. She was schooled on Saturday-morning cartoons andSunday funny pages. She picked up a pencil, started drawing, and never stopped. 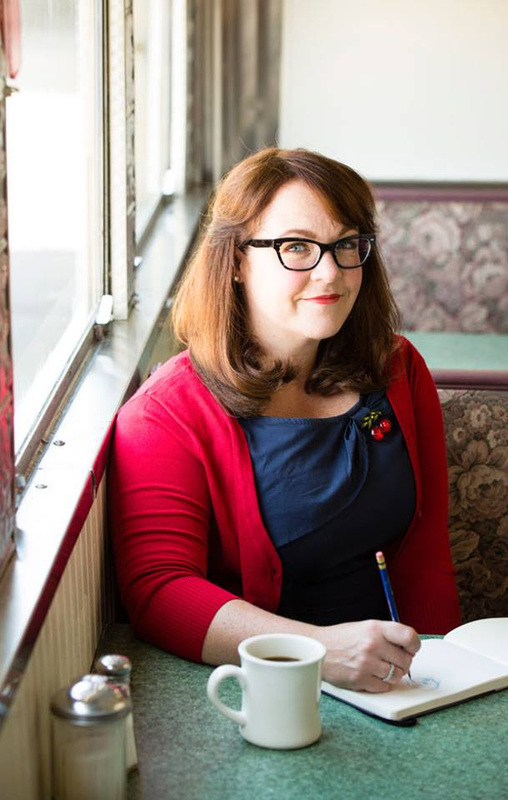 Kelly has illustrated two chapter book series: Elvis and the Underdogs and Elvis and the Underdogs: Secrets, Secret Service, and Room Service by Jenny Lee, and the Quirks series by Erin Soderberg. Louise Loves Art is the her first picture book in the Louise series with her as both author and illustrator. She is currently illustrating a book by Amy Krouse Rosenthal, called Don’t Blink! – which is a bed time book with a few surprises and the second Louise book is on deck. Check out Mr. Schu’s blog and Mr. Sharp’s blog today for other Louise Loves Art posts! Lovely post. Thanks for sharing it. I went to speech therapy in school one or two grades before I finally had fabulous, encouraging therapist who showed me how to hold my tongue for an “r” instead of squeezing my cheeks. Conquering that was I think what moved me from liking school to being a committed student. Lots of dads wouldn’t know how or spend the time or stay patient and confident in his child’s ability to do it. You got a good one. This is by far one of the sweetest, happiest, loveliest posts about learning to read. I am going to check out all of your books. Thank you for sharing such an important part of your life. It helps me, too, as a 2nd grade teacher! I am glad you liked it. It was a good memory. I adore everything about this. As a lifelong book lover, as the mother of three mini-booklovers, as the former tutor of many, many a struggling reader, and as an author myself. This is wonderful! Your own determination coupled with your father’s love and dedication to helping you are inspiring to say the least. Enjoyed the interview. There are so many kids who have difficulty with reading. I love your father’s approach and the bond it created between you. He was always really focused on our doing well in school. I think He marvels at the unplanned outcome of me making books! 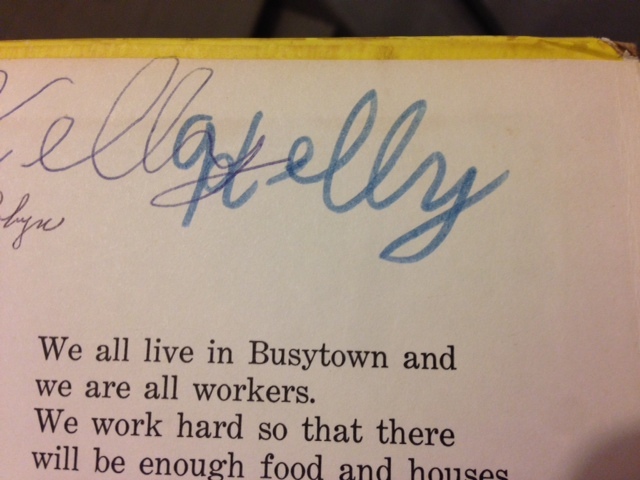 Kelly, this is a lovely glimpse into your girlhood. Thank you for sharing your world. Right!? It is a great book… then there is the punching. But then, kids punch. We don’t want them to. The thinking was so different back then. Kid’s books mere grittier. Love Lowly too! Great post, Kelly! What a beautiful post! I loved it and you are inspiring Kelly! Thanks for sharing your story! Oh, the joy of learning to read! I can still remember not being able to read and following my mother around the house with a library book, begging for her to read it to me. Again. I can sympathize with your speech problems, since both of my sons had to go to speech therapy. They both had trouble with consonant combinations like “sn” — so the word snack came out as “hhnack” — or “sh” — so shoes sounded like “whose”. I just found out you’re coming to Children’s Book World later this month. I’ll be there! 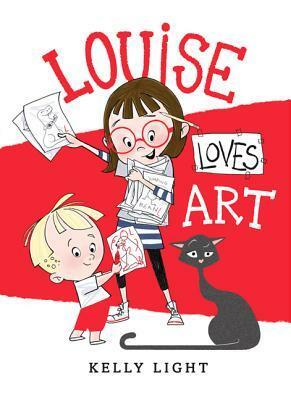 Can’t wait to have my very own copy of Louise Loves Art. Love, love, LOVED this post! My childhood was spent in Philly and the Jersey shore. Thanks for sharing your wonderful learning-to-read memories. And your new book looks fantabulous! Wonderful post! When I was young, my father would often stop at the grocery store on the way home from work to pick up something for my mother. They had a rack of Golden Books by the cash registers, and he would also usually buy one for me. I don’t know what became of my originals, but I work in a school library, and through years of donations, I have accumulated quite a collection. They are too fragile to circulate, but I occasionally read one to a kid or a group of kids. I remember many of the ones you mentioned; I always had a special affection for the Color Kittens! Weren’t their names Hush and Brush? Golden books had many fine authors and illustrators in their stable. Thanks for bringing back those memories! My oldest daughter also had some trouble learning to read. She’d pore over those Busy Town books for hours, though. And her favorite character was, for sure, Lowly Worm. Thanks for the wonderful post.